I'm spotting a trend here - new season, new Puffs! This time around the HM has donned his snowboarding gear and is celebrating winter the only way he knows - by adding to the base cereal with a snow themed addition. This time the base sugar-puffs taste similar to the normal variety but you get little bits of crunchy meringue to go with it. This is a strange choice - children are not notorious for their love of meringue, in fact if you give them some at a family party with fruit in they tend to pull funny faces (it's so worth it). Also this cereal doesn't have anything that isn't sweet to offset it. With some trepidation I decided to eat away. The box is decorated in a playful way and contains lots of lovely distractions that are suitable for children but not squarely aimed at them as apparently you aren't supposed to do that anymore (despite a good breakfast being one of the basic Public Health things you are supposed to encourage). I'm pretty sure the missing word is 'A' (because there is no such thing as a Snow Tractor - unless they meant Plough...). The cereal has a few unusual qualities. The first mouthful is fine - hard Sugar Puffs, hard meringue and milk all in harmony - but after a while it all goes a bit odd. 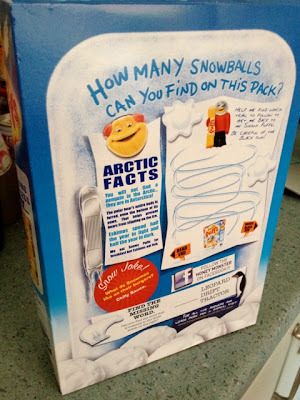 When the sugar puffs are soft due to the milk (which is fine - they don't go mushy they are just less hard) the meringue stays hard, this means that it's like finding a rock in your cereal. After the first few surprise crunches you anticipate it, but then you start to get a strange shift in the flavours as the meringues take over. This is easily fixed by making sure you only get one or two in a spoonful but if you hit three or four then it's like taking a bite out of some meringue without anything to balance it out and it's a bit sweet and papery and not at all pleasant. If this was a cereal with dried fruit in then they could go together quite well, even past the softening, but in Sugar Puffs it doesn't quite work and I much preferred the Toffee Apple variety. I think that a solution to this would be to put in less meringue - for me anyway - if you are a massive fan of eating this kind of thing with no topping then this may be the breakfast rush you've been hunting for. I think the more traditional route would be to have little hard marshmallows like in Lucky Charms (which we don't get much of over here) but then your cereal isn't vegetarian which is a Bad Thing in the UK where we are pretty good at special diets. Overall it's a fun little product and a great surprise for visiting children to try, but not one I'll be rushing for more packs of. I might try another one next year though. And I can't wait for the Honey Monster Spring Collection (with seeds maybe? or fruit? I'm no good at this!). I was wondering what the difference between the meringue and cereal marshmallows would be. Sounds like they should have went with the latter. Not many people seem to be a fan of lemon flavoured foods. I love lemon flavoured things, but there's usually to much sugar put into the mix which ruins the overall taste, like lemonade. I've had Meringue, that on hand tasted good, but then when you read the ingredients you realize that it taste like crap. 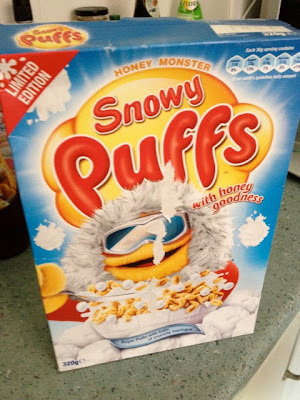 If this cereal tastes like actual meringue, then it must truly be good! Perhaps, the taste is geared more towards adults? Maybe, you could try heating up the cereal? Which hopefully will soften it and not melt the meringue pieces. Was the box you got kinda old? I fail to understand why they would stick hard meringue in the box. Definitely fresh & definitely hard/crunchy meringue - it kind of works but then it kind of doesn't! If you are a big fan of the stuff it's certainly worth hunting for.